Home » Blog » Make Way for an Uncluttered Bedroom! The bedroom is your own personal haven, the place you aspire for after a long day away from home. This is all the reason more why it should be a comfortable, uncluttered zone that evokes peace and tranquility….a place to relax and rejuvenate and get a good nights’ sleep. However, the reality is usually a little different as most people’s bedrooms end up cluttered with the things used on a day-to-day basis. Take a good look around your bedroom and ask yourself if you really need all the stuff in there. You might have furniture like chairs or settees or showpieces that you don’t use or need. They are cluttering up your room unnecessarily if you aren’t really using them – so toss them out. The bed should be the predominant feature in your room, but its size should complement the space in the room and not make it look too cramped up. Everyone loves a big bed, but it should leave enough space to move around without tripping over something! The area under the bed is ideal for storing some of the bulkier items. You can use this space not only as your linen closet but also for storing blankets and duvets. There are these little things that end up scattered all over the room as they are used on a daily basis. You can get matching neutral-colored storage bins with labels to keep these tidbits better organized. Keep the horizontal surfaces in your bedroom as empty as possible. Bedside tables should have minimal items on them. Drawers are best for storage but they can get messed up with time. Create boxes in your drawers for keeping smaller items like jewelry, medicines, glasses, keys, etc. Label other drawers for keeping bigger things like magazines, documents or clothing accessories. Avoid taking your work to bed – unless you have a work desk in your bedroom. Your bedroom could end up getting really messy with laptop, cables, files and documents otherwise. The most important way to keep your bedroom neat is to practice discipline on a daily basis. De-cluttering once in six months just isn’t the right attitude. Get proactive and put away things in their designated places as you use them. Fortius Infra has these amazing apartments ‘Fortius Waterscape’ in Krishnarajapuram, Bangalore that are a dream to live in. 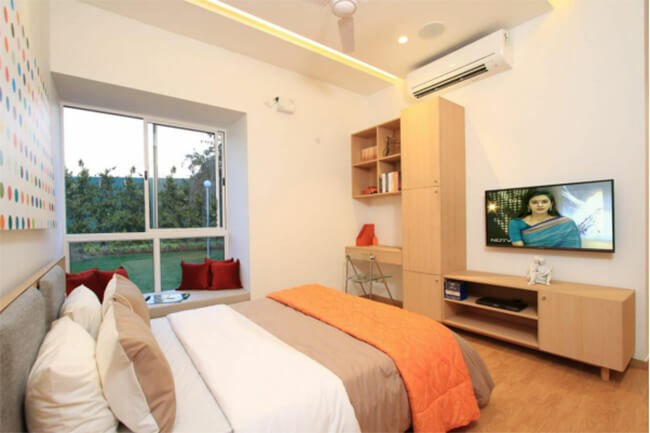 Find out more about these spacious apartments here: https://www.fortiuswaterscape.com/.